An ideal starter set to those who are looking to start a new art medium, the set is all in it's own handy sized tin. Watercolour pencils will release their rich pigments when a wet brush has been applied to them. A perfect combination with indian ink pens. The set includes watercolour pencils 107 cadmium yellow, 115 dark cadmium orange, 127 pink carmine, 136 purple violet, 120 ultramarine, 110 phthalo blue, 266 permanent green, 276 chrome oxide green fiery, 283 burnt sienna and 199 black. The set also contains the following Pitt Artist Pens: 199 black superfine(fineliner), 235 cold grey VI brush pen and 233 cold grey IV big brush pen. 1 x paint brush for using with the pencils. 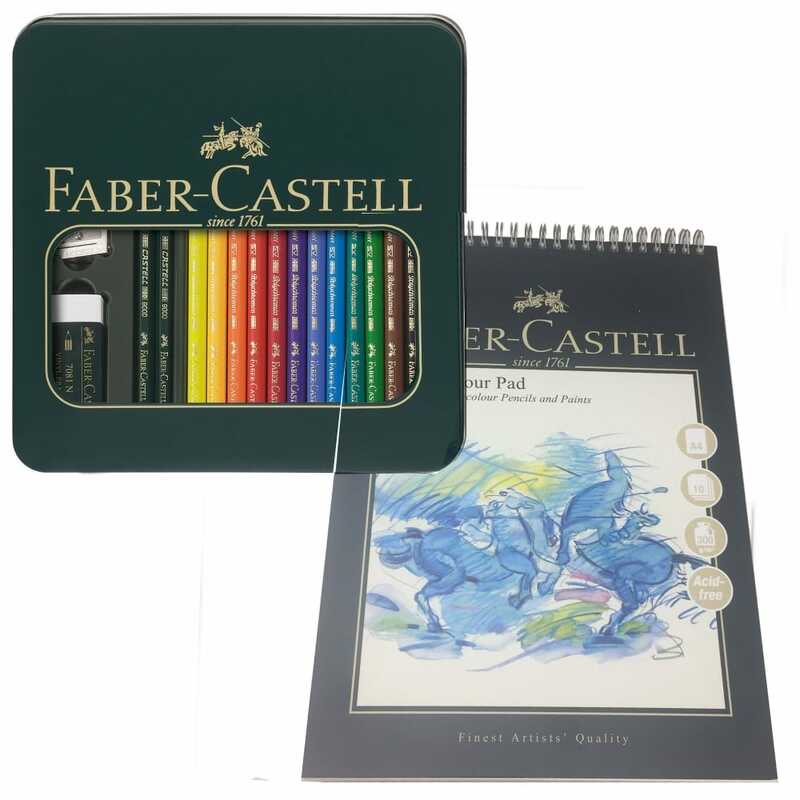 This Faber-Castell Sketch Pad is ideal for watercolour paints, watercolour pencils and Pitt Artist Pens. Perfect for art students, artists and hobbyists. 300gsm cold pressed 10 sheets of good quality watercolour paper, ideal for mixed media work.